I had to wait awhile for this wave, due to a preorder cancellation mixup. I wasn’t too worried about it, because for whatever reason the character selection of this wave wasn’t making me die for it. 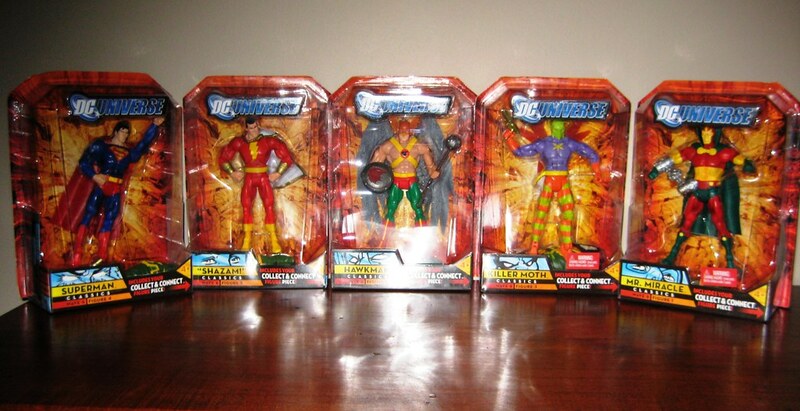 I was excited about Killer Moth, but there was nothing in the wave I thought I had to jump the gun and eBay for until I managed to get the whole set. These have been out for awhile and pretty well done on the net so I’m just gonna show my pics and say a few basic things. First off, I am totally, totally blown away by these figures. The improvements and developments in quality show Mattel’s commitment to this line. I want to say “best wave ever of anything” simply because, well, these are just so good. 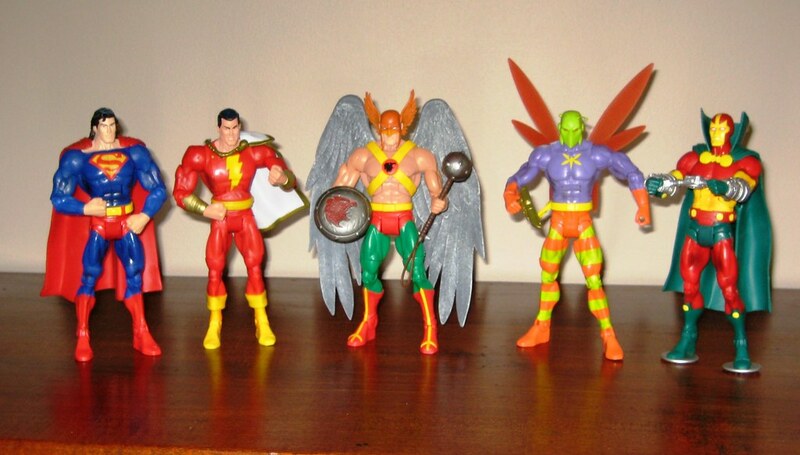 Hawkman is the star of the wave. 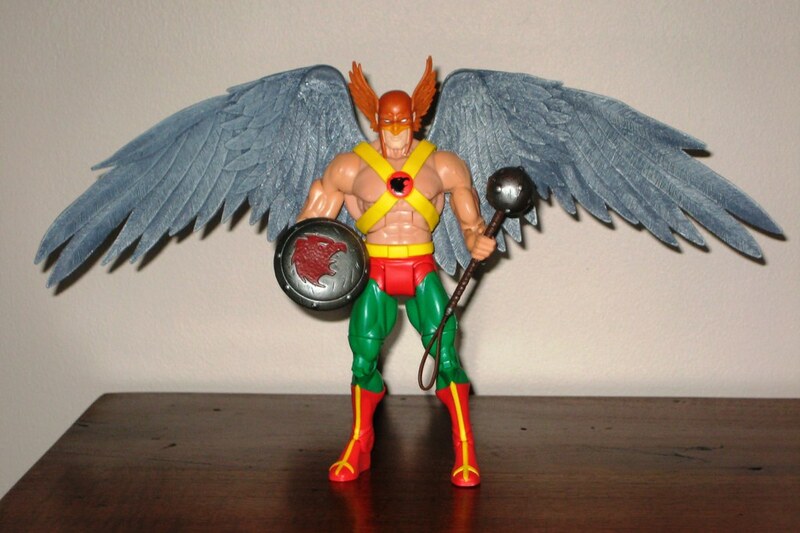 Best Hawkman figure ever, best wing assembly, totally steady on his feet no matter how you arrange the wings. Great accessories. Great everything. I can’t express how much I love this figure. Currently in line for best 6” male figure of the year as far as I’m concerned. Can’t wait to have Hawkgirl to go with him! Killer Moth is plastic perfection, and I only hope that me get more of the fun, hokey villains to go along with him – he’d look great next to a Crazy Quilt or a Calendar Man! Love the groovy clearish plastic used on his wings. I loved the recent DCD Kalibak and wasn’t too worried about whether or not I got this C&C as a result, but I am so glad I managed to do so, because he’s fabulous. For a moment I thought he’d stay as a bunch of pieces as I had trouble getting one arm and one leg to connect, but we got there in the end and he’s really groovy. By the way – please reassure me that I’m not the only person that has to look down at their own hands to work out which is the right and which is the left? Okay, maybe I am….. The other three figures are all great representations of the characters. It’s hard to go past the DCD New Gods Mister Miracle for me, but this one works well for this line and I love his manacle prop. He’s the only one that I am finding a tiny bit wobbly – not assisted by my five year old having a little mangle with him, grr! Shazam’s cheeky grin annoyed me in the pics I’ve seen but not in person – he works very well. Mullet Superman is so well done I don’t mind the mullet! The only QC-ish things I’d have to mention: and the first is the one thing everyone’s complained about: the orange wash on the yellow bits of Shazam and Mister Miracle’s uniforms – frown. That’s the reason we need to say “almost” perfect here, but it really doesn’t put a blemish on this great effort. The other is just that Mr Miracle’s legs are a bit loose at the hips (and this was pre 5-year-old mangling), but I have had a very good run when it comes to limbs on these figures. Oh, and is anyone else driven mad by the thin plastic bands wrapped around these figures?? It’s mostly because I’m impatient, but golly I find them a pain to remove, and wonder why they’re necessary when the figures are so securely pressed in to the plastic anyway – in fact most of these were so well squished in I had to cut them out. Plastic bands and twist ties are not the impatient toy opener’s friend. Look, the best thing I can say about these figures is that I went from not caring about the C&C to now wanting the blinking variants. Maybe I’m setting myself for a huge fall but with the highly improved QC in this wave and the fantastic character selection that keeps coming, plus the strong promise of Legion news soon, I just don’t have any serious reservations about this line anymore. 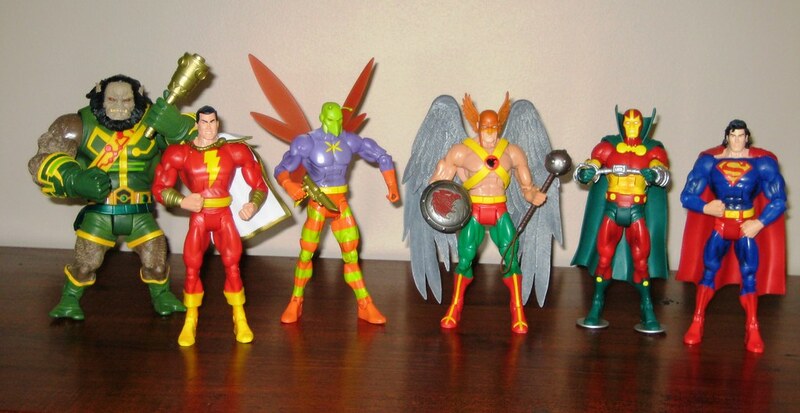 It doesn’t make me want to give up any other toy lines, but it makes me want everything DCUC has to offer. Bring it on! You can see a number of extra pictures at the AFB Facebook Page (which has a new look by the way ) and discuss this in the DCUC Wave 6 Discussion thread at the AFB Forum.